Hello all! Today we have Daniel Childs who is involved with the Gamebook Authoring Tool, an invaluable tool for anyone who wants to write a gamebook. Here, Daniel talks about how he created and developed the tool. 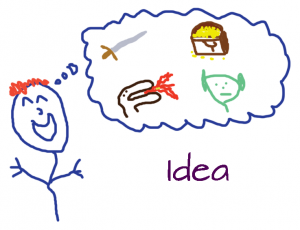 How did the idea for the Gamebook Authoring Tool come about? I wanted to write an Android App and I wanted to use my favourite game format: Choose your own adventure. I sat down to plan it. I opened up my word processor, I opened up a spreadsheet, I pulled out pieces of paper and started drawing flowcharts on them. I wondered why gamebook authoring was so hard. I searched online and still couldn't find the solution I was looking for. I wondered how other people solved this problem and it turns out most people just struggle. So I realised there was a gap for a piece of software like the Gamebook Authoring Tool. So I started writing it....Meanwhile the gamebook industry on mobile devices really took off so, having missed that boat, I concentrated on making GBAT the best gamebook authoring software out there. What kind of features did you want in the first version of GBAT? I wanted it to be a visual tool - I have always quite liked flowcharts and a gamebook is basically a massive flowchart. I enjoy seeing the flowchart grow and evolve as you work in GBAT. The other feature I wanted to achieve was the removal of tedium and error creation in gamebook. Things like renumbering sections while retaining the links to the correct paragraphs is actually quite an error-prone manual process. But most of all for the first version I wanted to get the software out there and in front of people - I want this software to be driven by gamebook authors, not just me. When you started, did you look at other gamebook creators? Yes - my favourite was Inkle. I just loved the way you could dive into it. They are also producing some really good gamebook apps at the moment. I wanted GBAT to be more of a design and planning tool - but like Inkle I would love the text writing to be a bit more immersive. How has GBAT evolved over time? Features are carefully added - I want it to be a useful but not an overwealming product. GBAT is user driven - I love hearing from users of GBAT and those requests get prioritised. More output formats have been added and the look of the flowchart has changed quite a bit over time. As gamebooks grow we need to condense the flowchart while making it still look nice. For the last version of GBAT we added zooming for the flowchart and also a new way to visualise your gamebook - the outline view is a way to view the sections of your book in a linear, sequential manner. Apart from subscribing to GBAT, can your customers help you? A couple of ways! You can drive the development of the software - it's really nice to get emails - Tell me what you like about GBAT, what you don't like, what you'd like to see in future releases. Try out the sofware if you haven't already, there's a lot you can do in 100 sections. After this you can blog about or review your experiences, or mention GBAT on social media - anything helps really. Hello all! Today, we interview someone who is involved with creating an invaluable help to gamebook authors all over. 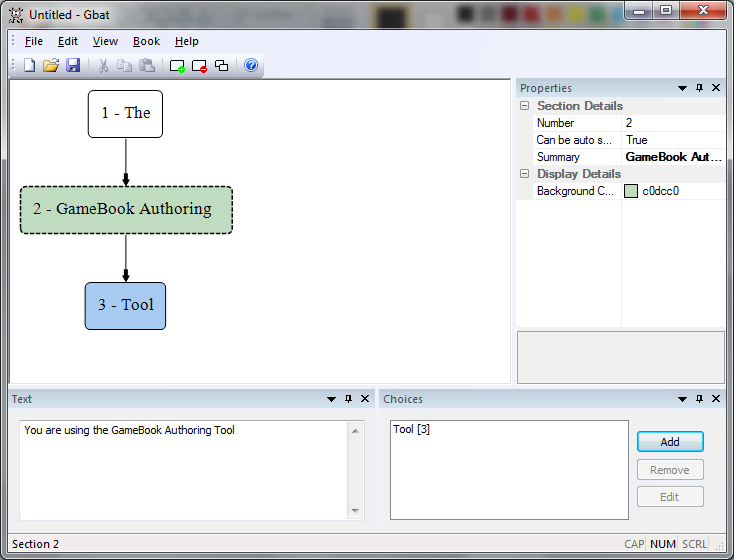 If you want to write gamebooks, you'll need the Gamebook Authoring Tool. You made the free version of GBAT to create a 100 section book in rich text format (so it can be entered for Windhammer). Have most of your customers been Windhammer contestants? I don't know if anyone has built a Windhammer entry using GBAT exclusively. It can certainly be used for Windhammer entries though. 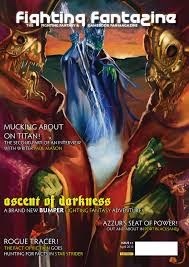 You've also published reviews of the Windhammer entries. Have you enjoyed the Windhammer competitions? Yes, I love the Windhammer competition! There's always a wide variety of genres and styles and gameplay, always lots of surprises. 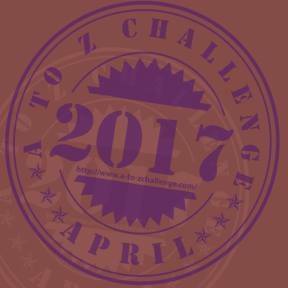 The prizes are getting better too - now the winner of the competition becomes a published author via Tin Man games. Wayne Densley is doing a fantastic job with the Windhammer community. What's the longest book published with GBAT that you know of? Can you tell us of any future developments? Yep, the next release is going to have tidier and more responsive flowcharts. It will also be in a detachable window so now you can write and see the flowchart on a second monitor if you wanted. I've had a fair few emails from application developers too, so we're going to have XML and JSON export options. At some point we're going to support Choice Of script, because I get a few requests for that. We also need to improve the text editor. Eventually we can get into gamebook analysis and that will open up lots of interesting avenues to explore. You can get the Gamebook Authoring Tool from here. For another great gamebook kickstarter, check out Westward Dystopia which is well on it way to being funded.